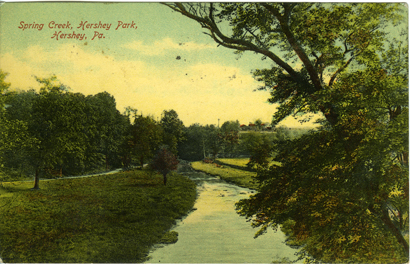 Milton Hershey recognized that opportunities for recreation would be critical to the success of his planned model town. As he laid out his model industrial town, Milton Hershey set aside 150 acres of land for a park. The land was located to the north of the town and chocolate factory. Hershey Park was developed while the chocolate factory was under construction. Plans for the original park were modest. The site featured Spring Creek which meandered through the park. Hershey Park was beautifully landscaped and offered extensive walking paths throughout. A large structure was built in 1904 to provide space for entertainment, including dancing and roller skating, even before the Park officially opened. Milton Hershey encouraged the establishment of a community band that performed in the Park throughout the summer season. He provided instruments and uniforms and encouraged his workers to join the band. A bandstand was soon built to provide a proper setting for concerts. From its inception, Hershey Park was designed with families in mind. The original park offered picnic pavilions for families and groups and children’s playgrounds dotted the park, offering slides, swings and teeter-totters. Spring Creek was soon dammed to create a boating lake. Spring Creek meandered through the location and became a focal point in the beautifully landscaped Park. Scenic bridges and overlooks were added to enhance the Park’s natural beauty. The Park’s main entrance featured an open lawn with extensive flower beds as well as newly planted trees and shrubs. In an era when many rural areas did not yet have electricity, Hershey Park was lit with power supplied by the chocolate factory’s generators. Electric lights along many pathways and in the dance pavilion made the Park an impressive sight in the evening hours. Soon after the Hershey Chocolate Factory opened in 1905, baseball teams were organized prompting the construction of a baseball field that year. The teams were sometimes small in the early years, but the games played on the Hershey Park athletic field were often attended by large and enthusiastic crowds. Spectators packed the grandstands to watch Hershey take on teams from Elizabethtown, Lebanon, Harrisburg, and their intense rivals from Palmyra. The growth of the town had a significant impact on the Park’s development. Public interest in Milton Hershey’s model industrial town brought visitors and Hershey soon became a tourist attraction. Hershey Park quickly developed along the lines of a trolley park as rides and other amusements were added. With a five cent fare, the trolley was a primary means of transportation for local communities traveling to the Park in the early years. Hershey Park’s evolution from community park to amusement park was also encouraged by its proximity to the Reading Railroad. Each year saw new improvements to the Park. In addition to weekly band concerts, vaudeville acts were booked to perform in the Park pavilion throughout the summer season. In 1908 the Park’s first official ride, a used carrousel and band organ, was purchased. In 1909 an amphitheater, two bowling alleys and a photographic gallery were added. The following year, the Park’s Miniature Railroad opened. The miniature railroad ran from the Park’s main entrance around the outskirts of the park to the baseball grandstands. That same year, the Park’s increasing popularity prompted Hershey to enlarge the Park Bandstand and the Park’s restaurant. Throughout the teens new attractions were added every year. The original swimming pool was improved and enlarged for the 1912 season. The first carrousel was replaced in 1912 with a larger one designed by one of the premier carrousel makers, William Dentzel of Philadelphia. The Bandstand was enlarged again in 1914. In 1915 the Convention Hall, with seating for 6000, opened, providing Hershey with a large-scale venue to host major conventions and performers. World War I created a worker shortage and Park hours were shortened. Wartime restrictions caused the railroad and trolley service to discontinue special Park excursion trains and rates. Even with these limitations, the Park continued to present vaudeville and summer stock, as well as movies in the main pavilion. Hershey Park’s growth mirrored the fortunes of the Hershey Chocolate Company. In 1919 Milton Hershey gambled on sugar futures and lost. The Chocolate Company was forced to heavily mortgage itself and the lending bank sent an administrator to oversee the company’s finances. Spending was sharply curtailed and employees made herculean efforts to improve the Chocolate Company’s profitability. In three years the debt was refinanced and the bank’s administrator was removed. To celebrate and in honor of the town’s 20th anniversary, Milton Hershey ordered a roller coaster for the Park. With the introduction of the Wild Cat roller coaster, Hershey Park was responding to new trends in amusement parks. Amusement parks boomed during the 1920s adding rides to thrill visitors. Following this trend Hershey Park opened two more thrill rides during the decade, bumper cars and the Mill Chute water flume. World War II had a dramatic impact on Park operations. Gas rationing curtailed visitation, though trains and trolleys continued to bring visitors to the Park. The Zoo was closed in 1942 and the Ballroom also closed for a few years as a result of gas rationing. The end of World War II brought hope that life would return to normal on the homefront and in Hershey. Hershey Park celebrated with the addition of a new roller coaster, The Comet. Opening for the 1946 season, it would be a last hurrah for the Park for several decades. Milton Hershey’s death in October 1945 had a dramatic and long reaching impact on the community. The town had developed through his vision and leadership. Without him, there was a vacuum in vision and his businesses responded by trying to maintain rather than grow. Everything was changing around Hershey, particularly in travel and leisure. There was a significant increase in the amount of leisure time available to people in the post-war years. A booming economy resulted in families with the means and the time to take vacations. Cars became the preferred means of travel for family vacations. Television had a dramatic impact on people’s expectations for what they should experience when they went on vacation. The development of Disneyland in 1955 forever changed how people viewed amusement parks and what they anticipated experiencing at a park. Millions of people were exposed to Disneyland through an ABC network television series, Disneyland, that showcased the new amusement park. Disneyland reflected the energy and expectations of post-war America. Disneyland captured the United States’ imagination and reinforced the post-war convictions that the past was tired and the future was bright. Traditional amusement parks such as Hershey Park would not fare well in such a climate. For most of the 1950s and 1960s, the Park continued its tradition of adding new rides and attractions. However, the rides added to the Park during this time were carnival style rides, such as the twin Ferris Wheels, a miniature golf course and several new kiddie rides. The Park did make some efforts to respond to changing times. In 1959 a rock and roll band, Bill Haley and the Comets, performed at Hershey Park Bandstand. Dry Gulch Railroad, the park’s first major ride in more than a decade, was added in 1961. The Park continued to make some efforts toward improvements in the 1960s. New rides were added, including the Aero Jet and the Sky Ride. The Mill Chute was redesigned and rethemed to become the Lost River. To address the community’s increasing problems with traffic, Hershey Estates and Hershey Chocolate Corporation financed the construction of the Monorail to ease downtown congestion. But these kinds of changes were like putting a finger in the dike. Public interest had been captured by Disney’s imagination. Television had opened a window to a variety of new experiences and worlds. By the late 1960s, the Park was looking a bit worn around the edges. The Park also struggled with increasing vandalism and petty theft because the open park layout was a boon to those bent on mischief and there was no effective way to control access with the Parks’ multiple entrances. The Park in its current form was not a viable proposition. Hershey Estates hired Randall Duell and Associates, to develop plans for a themed Hersheypark. In 1971 the Park changed its name to Hersheypark, fenced in the Park, and established a one-price admission plan of $3.50 for adults. Needless to say, these changes were not welcomed by all. The community protested loudly. The next two decades would be full of highs and lows for the Park. From the beginning, the redeveloped Hersheypark faced a variety of challenges. In June 1972, Hurricane Agnes hit, flooding Hershey and the Park. These setbacks, as well as continuing cost overruns with construction, took a toll on development plans. Doubts and concerns about this new vision for Hersheypark were erased with the opening of the 1973 season. Opening day was a huge success and heralded a highly successful season. In 1975 Holiday Magazine named Hersheypark the cleanest and greenest amusement park in the United States. In its redevelopment as a themed amusement park, Hershey had taken great care to save as many mature trees as possible and planted many additional new trees. In addition, the Park was enhanced by extensive flower beds and plantings throughout the park grounds. Entertainment continued to be a major part of the Park’s new program. Even though the original Bandshell was razed in 1973, a new amphitheatre provided a venue for headliner entertainment. The 1990s was a period of accelerated growth for the Park. New areas were developed and several new rides were added. Minetown was expanded with a new arcade and new rides such as the Flying Falcon. The Pioneer Frontier added the Sidewinder in 1991. Hersheypark expanded the boundaries of the Park with the development of Midway America.. The new area significantly expanded Park acreage, easing a sense of congestion present on the Park’s busiest days. In spite of the additional room to grow, in 1998 Hersheypark’s next ride, Great Bear, was a demonstration of the Park’s ability to add major new rides within the footprint of the original Park. Since the construction of The Wildcat, the Park has followed a steady course of adding major attractions and rides every other year. These rides have offered visitors a broad range of experiences from high level thrills to family fun. Roller coasters have included Great Bear, Lightning Racer, Roller Soaker and Storm Runner. Seeking to appeal to entire families, in 2006 Hersheypark introduced Reese’s Extreme Cup Challenge, an interactive dark ride designed to be fun for guests of all ages. Hersheypark’s success and its status as one of the United States leading theme parks was recognized in 2000 when the Park received the Applause Award at the International Association of Amusement Parks & Attractions Convention in Atlanta, GA. The Applause Award is a highly coveted international honor. In 2007 Hersheypark launched a major new attraction, The Boardwalk at Hersheypark. This new area of the park featured a variety of water rides, a children’s interactive water play area and new concession areas. The success of The Boardwalk led to its expansion in 2009 with the addition of a wave pool, intercoastal waterway, cabanas and additional concessions. The story of Hersheypark’s growth and development is remarkable as a story of enduring success through changing times and attitudes. It is also remarkable for its commitment to reflecting Milton Hershey’s vision for the Park: to be a clean, green destination that offers quality entertainment to families and guests of all ages.